Conversation One @ New Paltz | Conversation…* before the next crisis. Today’s scheduled Conversation is cancelled due to bad weather and unreliable travel conditions to campus. My apologies. This week the SUNY New Paltz College Council meets to consider whether to rename buildings named for original Huguenot settlers who owned slaves. The choice seems obvious to many of us: some in our community are in pain, let’s fix it – a moral wrong exists, let’s right it. Yet for others, these arguments are not enough: there are more important issues facing our country – we shouldn’t let one historic evil erase all the subsequent good. And no matter which side “wins” many are experiencing deep pain around the question. Why is this so hard? Care to discuss? 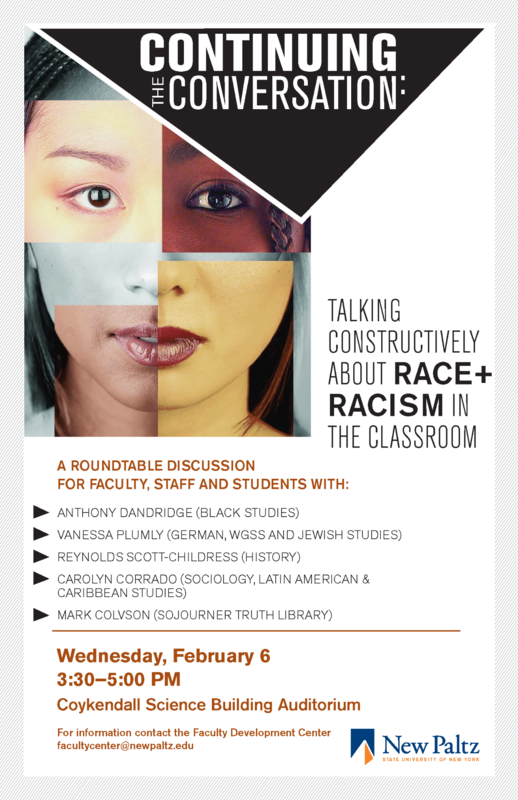 Conversation One is a weekly dialog on issues of inclusion and diversity, open to everyone, regardless of background – students, staff, faculty, members of the wider community are all welcome. If you feel angry, scared, confused or just curious, you’re invited to come and work toward understanding, healing, and strengthening our community, even where we feel deeply divided. This bugs the &$#% out of me. We’ve just met, or maybe chatted casually a couple times, and now you can understand how personally hurtful, enraging, etc. my experience was for me?! I imagine a person who is female, East Asian, queer, or trans, feels something similar when the person who instantly “knows how they feel” is from the majority/mainstream. True statement? Unfair generalization? Care to discuss? Happy New Year! Hope to catch up with you next week. If beauty is the quality in a person that shines a light on the goodness of others, and looks always for the best in the people around it, then many beautiful people pass among us unnoticed and unremarked. Could we use this last Conversation One of the year to refresh in ourselves this more healing definition of beauty? Would you share a story of someone you’ve known whose beauty wasn’t the magazine cover kind, but made those around them better and more beautiful in turn?